ION Reporting is a powerful analysis tool that allows the eoStar user to quickly and easily build reports for inventory, sales, finance, etc. ION reports utilize a cache which allows users to quickly get information. This cache needs frequent updates to provide the most accurate information, but when the cache is complete, ION Reports are precise and fast to run. Additionally, the cache is attached only to the specific workstation, so the reports are only run from the information on that workstation. This ensures that multiple users can create reports simultaneously, yet eoStar will continue with the same level of functionality. Note: If the Auto Refresh check box is checked, than any changes made to ION Reports will instantly be shown. When this is unchecked, in order to show changes made to the reports, click the command button Refresh. Mobile ION is the use of ION Reports without a direct connection to eoStar. It functions by taking the information needed to create reports directly from the ION cache on the workstation. This functionality is very useful for instances where quick reports are needed to be generated when the user is unable to connect to the database. For instance, a salesperson may wish to generate a No Buy Report for a specific Customer Chain for a sales pitch. Mobile ION allows the salesperson to generate this report instantly on their laptop with the information from their last ION update. Note: Mobile ION limits some functionality like the ability to Save and Delete Layouts or take Layout Snapshots. However, the ability to load previously saved layouts still functions. In order for employees to access this functionality, the "May Use Mobile ION" checkbox on the Plugins Panel must be checked. Mobile ION Status bar on the Mobile ION screen. 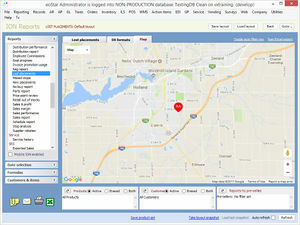 You can either run the reports from this screen, which also allows the user access to other information within eoStar. To run a more limited form of ION Mobile, go to File>Connect to Database. Click the hyperlink Mobile ION. You will be taken to the Login screen. Login as you would usually do. Note: Now there are only two menu options - File and Help. Also note the Mobile ION Status bar located on the right. This contains the status of ION. Once a report has been fully customized, it can be saved as a Layout for repeated access. Saved layouts may be marked as a Favorite for quick access. This is particularly useful when there is a large number of saved layouts from many users. Each user can create their own list of favorite layouts. Once the report design is complete, click the Save Layout button. Choose to either Add a new report layout, or Replace the currently loaded report layout. Enter a Full Description (optional). 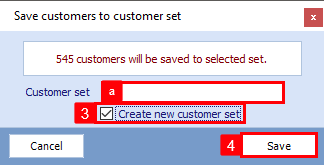 Select a Customer Set (outdated). 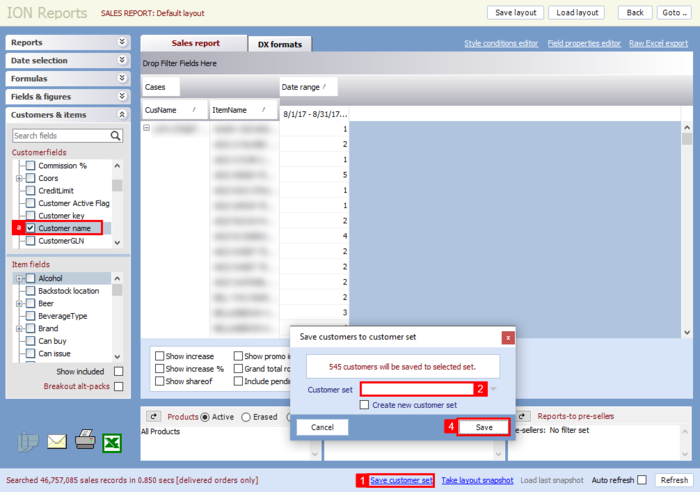 This functionality is now a link located at the bottom of the report screen: Save Customer Set. Available on Mobile Devices - Check this box to make the report layout available on eoTouch devices. Each employee must have the ION report permission enabled on the Plugins panel of the employee record. Employee must not be filtered out in step 7. Favorite Report - Check this box to add the layout to the Favorites menu. 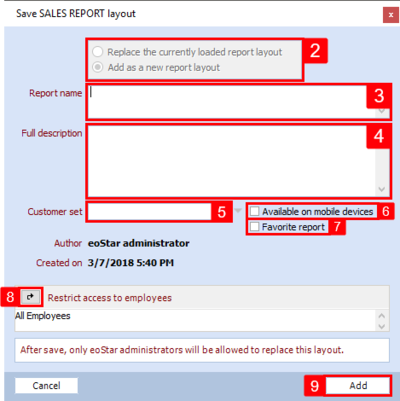 Restrict Access to Employees - Use this filter to restrict which employees are able to access this report layout. Click Add (or Replace) to save the layout. Select the type of report from the Reports tab. Select the layout to mark as a favorite. This button will change to say Remove Favorite. Click it again to remove the layout from the favorites list. Repeat steps 3 and 4 for additional layouts. Close the load layout window. Go to Reporting > ION Reports. Snapshots are a way of marking a reports design or layout before changes are made. The snapshot includes the information and the dates of the data at the point of the snapshot; however, unlike layouts, snapshots are not permanent. Instead, snapshots only last until the user logs out. To take a snapshot, click the hyperlink Take Layout Snapshot. To load a snapshot, click the hyperlink Load Last Snapshot. This feature is available on many ION Reports that include customer information. It allows the creation or updating of a Customer Set to match the customers listed in the report. Once the report design in complete, click the Save Customer Set link. a. NOTE: The Customer Name field must be included in the report for this feature to work. b. NOTE: Since the Sales Report is setup as a Pivot Grid, only the Customer Selector will be considered when saving a Customer Set, filters in the grid itself will be ignored. Other ION Reports will respect filters when saving a Customer Set. 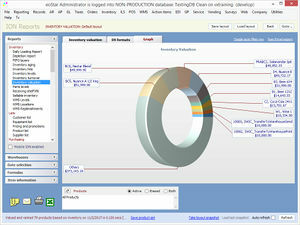 This feature is available on many ION Reports that include product information. 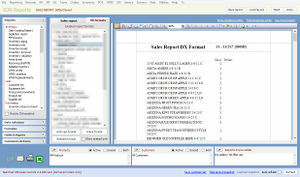 It allows the creation or updating of a Product Set to match the products listed in the report. 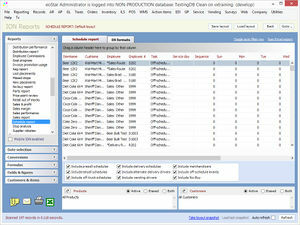 Once the report design in complete, click the Save Product Set link. a. NOTE: The Item Name field must be included in the report for this feature to work. ION Report Panels will dictate what data appears in the report grid. Some panels will consist of multiple column headings available to add to the reporting grid, while others will narrow down the warehouse and/or date range to analyze. The available panels will vary based on report selected. Reports - The Reports panel lists all reports available for the logged in employee to run. Warehouses - Select which Warehouses should be included in the report data. Date Selection - Select the date, dates, date range, or date ranges to include in the report data. Conversions - This panel is used to select how the data within the report grid should be converted. Sample conversions are gallons, case equivalencies, wine bottles, etc. Vend Sales - Choose to show sales data from orders and vend tickets, only orders, or only vend tickets. Formulas - This tab is used to create and maintain custom formula columns for the report grid. Once added to the report, the Expression can be edited for a customized reporting field. For more information, see ION Formulas. 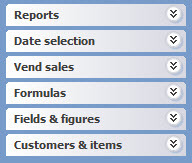 Fields & Figures - Additional fields and figures provide available column headings to add to the report grid. Customers & Items - Customer & item fields are attributes of the customers and items that can be added as columns to the report grid. The fields here are sourced from customer records and product records. The available tabs will vary based on which ION report is selected; the various options are detailed below. For more information see ION Reports - Dx Formats Tab. Gallery - Here it is possible to select a graph or chart to view the data in. Color - Here it is possible to change the color scheme of a section of a graph, or the entire graph. Properties - In this section it is possible to edit the properties of the graphs. The Map tab will show the report data charted on a Map. This is beneficial when reporting on topics such as lost placements to see where the customers are located that were lost. 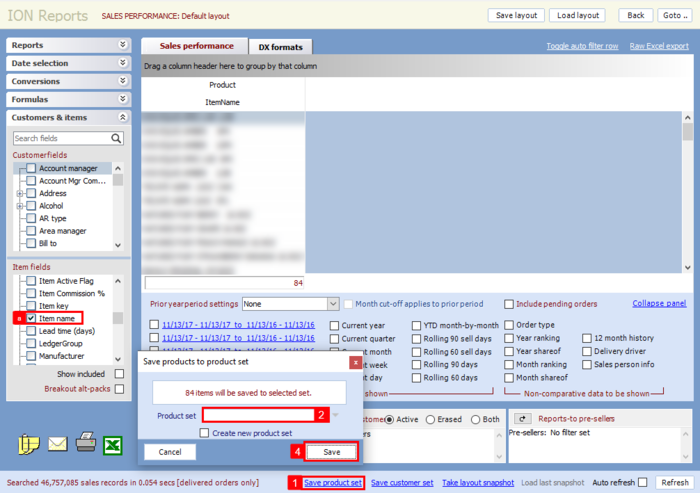 To select what products or customers will be shown in the report, use the drop down arrow to bring up the Include or Exclude Screen. Under Include, check the check boxes associate with the information wanted in the report. Under Exclude, check the checkboxes associate with the information that should be excluded in the report. To exit the Include and Exclude screen, click the x located at the top. Note: If two Include categories are selected, the information reported will be information that meets both of those criteria. For instance, if the Brand Family of Miller was selected as well as the product class of kegs, then the information reported would be all Miller Brand family products which are kegs. For additional information, see Product and Customer Selection Popups. Occasionally, certain product categories and customer sales channels will not need to be used in reports. To exclude Customers from ION, go to the Records>Customers>Sales Channel screen. Check the check box Omit from ION Reports. 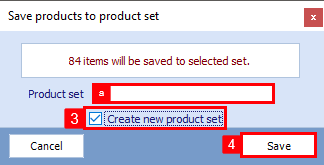 To exclude Products from ION, go to the Records>Products>Categories screen. Check the check box Omit from ION Reports. By excluding customers or products, all sales regarding these will not be reported. If there is a major discrepancy in what is reported and what the company should have, make sure these checkboxes are not checked. If Reports are displaying incorrect values, then the ION Cache may not have been properly updated. To fix this issue, rebuild the ION Cache. Permissions relating to ION reports can be found on the Plugins panel of the employee record. Each ION report has it's own unique permission that must be enabled in order to run, as well as a handful of additional permissions. This page was last modified on 18 June 2018, at 13:58.